Lisa Goldman and Morocco win the $10,000 Open Welcome Stake, sponsored by Adequan, during the Showplace Fall Classic Championship. Wayne, Illinois - Sept. 10, 2015 - More than two seconds separated the top three finishers in the $10,000 Open Welcome Stake, sponsored by Adequan, at the Showplace Fall Classic Championship on Thursday. The lead continued to change hands throughout the 13-horse jump-off, with each consecutive rider gaining speed in an attempt to find their way to the top of the leader board. In the final moments it was Lisa Goldman and Morocco who would set the unbeatable time, taking over the lead as the penultimate pair of the class to trip the timers in 36.513 seconds. Out of a field of 23 horse and rider combinations, 13 mastered the opening track. Brazilian course designer Guilherme Jorge, who will also be designing for the 2016 Olympics in Rio, was pleased with the result. He designed a technical track that challenged the riders with a tight time allowed of 81 seconds, using the large Grand Prix Ring to his advantage with long lines, a double combination and an oxer-vertical-vertical triple combination. Jorge commented saying, "It is always nice to come to the Lamplight facility and work with Showplace Productions. The conditions are very good; the footing is amazing, and we have a good jump crew and beautiful jumps. Today's class was to prepare and see how they are going before the grand prix this Saturday. I think we saw a good result, and I think we will be able to do a good course for Saturday's class." He continued, "The idea is to not go so big, but put some questions in the course for the riders. It shows that they are jumping well. I think for the grand prix I will build a little bit bigger, and the degree of technicality will be about the same. They showed today just how comfortable they are jumping on this amazing footing." Goldman was the busiest rider of the class, earning not only the day's victory, but also the third place finish with Centurion B, the sixth place with Rocs to Riches and the seventh place with the hunter turned jumper, Hindsight. She praised Jorge for his course, admitting that Showplace Productions brings in some of the most respected course designers, and that she always is challenged by their courses and learns from their tracks. She said, "The course felt really good. It was technical, but it wasn't over-facing. Guilherme designed it so that it welcomed you in, and then you kept going with a nice flow. It is such a big fun ring, and Pat [Boyle] really does bring in amazing people. It is really cool; he sets up the ring and makes it feel big but uses all of the space in it. You use a lot of the ring, and it didn't tire the horses out." Goldman originally set the pace early on in the class with Centurion B, stopping the clock in 38.958 seconds with the first of the double clean efforts. Douglas Boyd and Berkley III followed soon after, to take over the lead in 38.291 seconds. Although Boyd stuck to the inside track, and fellow competitors attempted to catch him with no avail, Goldman was not concerned. "I knew that if I was double-clean we would win it, he is just that naturally fast," Goldman commented. In order to guarantee a clear effort over the short course, Goldman relied on Morocco's natural foot speed. "He is so catty and good. I knew that if I stayed smart and didn't cut in too hard on the turns, then we would be faster," Goldman said. "If I am good, he is good, so I don't really worry about other people's times too much." She was able to catch the first seven strides from the opening oxer-vertical bending line of the short track, and from there she focused on staying safe. Even doing six strides rather than five down the final line did not detract from their speed, and they landed from the final vertical in 36.513 seconds to take the win, with Boyd settling for the second place more than two seconds behind the speed demons. "He was insane, which is good--He was really wild," Goldman said. "It was a bit of an advantage for me to have him as my last horse of the class. I was able to see where I needed to push him and what I needed to do. Today, there was no where I needed to push him. He was feeling it." Maggie Jayne was awarded the fourth place as the most conservative of the double clean efforts, riding Splendor to the time of 42.510 seconds. Nick Novak and Dirkie Z took the fifth place finish as the fastest of the four-fault rounds, while Goldman rounded out the top six with Rocs to Riches. On behalf of Showplace Productions, owner and competition manager Pat Boyle said, "We are extremely thankful for Adequan's sponsorship of all of the Showplace Productions' competitions. Allyn Mann has been a generous supporter of our events, and it is a pleasure to have Adequan as a partner." Director of Luitpold Pharmaceuticals Allyn Mann said, "The philosophy of Adequan is to identify events that have people who are serious about their animals, competing with them and wanting to do the best that they can for their health and well being. We identified this venue as one of those opportunities to give back to the equestrian community. We are proud to support the competition there with Pat Boyle, and all he is doing for this part of the equestrian world. It is our way of showing appreciation for all the people who are supporting us with the use of our products." The Fall Classic Championship Horse Show is one of the Midwest's most important competitions and includes the USEF Zone V Horse of the Year Finals, the IHJA "A" Medal Finals and the Marshall and Sterling Midwest Finals. The $30,000 Showplace Grand Prix set for Saturday, prior to the start of the Marshall & Sterling Junior Medal, Sore No More Children's Medal and Farnam Adult Medal Finals. The IHJA equitation medal finals will conclude the championship competition on Sunday with a full day of medal finals. Russell Frey and Kodachrome won the $2,500 USHJA National Hunter Derby at the Showplace Fall Classic. 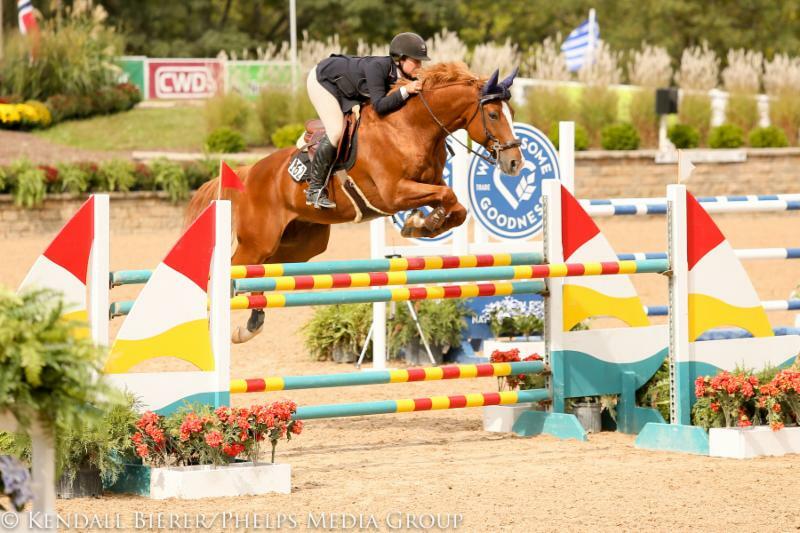 The third day of the Showplace Fall Classic Championship featured the much-anticipated $2,500 USHJA National Hunter Derby in the Wisconsin Equine Clinic Arena. The riders took to the beautifully landscaped course, designed by Pat Boyle, shortly after the conclusion of a torrential afternoon rainstorm. It was Russell Frey who captured the derby victory with Kodachrome. Receiving the score of 89 in the first round and an 87 in the handy, plus four high options for a total of 180, Russell Frey seized the victory on Nina Moore's Kodachrome as the first entry in the order. Frey, from Bativia, Illinois, and the 7-year-old chestnut gelding, began showing together in July and have found success in the derby ring. "He has won two [derbies] now, and has placed second twice," Frey smiled. "Last week, he was out in the big field for the National Hunter Derby in Chicago, and then he had to come here and step into the ring-he is pretty unflappable. He is learning and trying to figure it all out and he is doing a really good job. I really think he is a fabulous horse and I have a lot of high hopes for him." Frey continued, "My strategy was to go smooth and nice the first round. It was raining earlier when he went, so he was a bit distracted, but I thought he went really well. In the handy, he is good about turning so I had to plan. The hardest part was coming straight from the gate for the seven strides in the first line." With Kodachrome, Frey chose to stay wide and take the outside track instead of taking a risky tight inside turn to the outside line. It was a move he executed on his second horse, Prescott, who placed third. "When I walked the course [the turn] looked a little snug, so I was debating if I could do it," Frey explained. "On Kodachrome, when I came out of the in-and-out, I caught a forward distance to the oxer, which he jumped phenomenally. He landed great and I didn't think it was a necessity. With going so nice in the first round, I wanted to keep him confident, really happy, and I didn't want to get too crazy with it." After a busy, but successful summer full of showing, Kodachrome will have some well deserved time off. Frey, who has been a long-time competitor for the Showplace Production competitions has enjoyed the Fall Classic Championship, hosted at the Lamplight Equestrian Center. "I love the facility, and Pat Boyle does a great job organizing the horse show. It is good to be here. Even with the torrential rain, the footing held up great. If you look at the ring know, it doesn't even look like it rained." Caitlyn Shiels, from Naperville, Illinois, placed second in the derby on Margo Lyons' Kadence Darco after receiving a total of 179. In third place was Russell Frey on Prescott, owned by Andrea Ferguson, who rode to a total of 173 points. In the First Year Green Hunter division, Rachel Johnson on Callie Kennedy's Cracker Jack clinched the championship. Molly McAdow on Charlie Brown, owned by Lanie Bricker, earned reserve championship honors. In the Performance 3'6'' Working Hunter division, Douglas Boyd of Mettawa, Illinois, on Calido's Son, who is owned by Mimi Rothman, was awarded the championship tricolor. Freddie Vasquez of Chicago and Kira Telford's CR Moet received the reserved championship. "I rely on him to show me the way, I guide him and keep his pace the same, and it all works out," Boyd said. "He is pretty much a treat monger. We spoil him and he deserves everything!" Kathleen Caya, of Hubertus, Wisconsin. won the championship rosette on Grace Egan's Rock On in the Performance 3'3'' Working Hunters. Hillary Johnson, of Grand Rapids, Michigan, won reserve championship in the Performance 3'3'' Working Hunters also capturing the $1,000 Open Hunter Classic on Altair Farm's Eclipse. "He went really well!" Johnson explained. "Today the left lead line was set on a different angle off the turn which took some negotiating, but other than that, I thought he went beautifully!" Johnson continued, "Eclipse is a prince, loves treats, and loves to be told he is wonderful." The Showplace Fall Classic Championship continues this week with the Junior and Amateur Hunters, as well as the weekend highlight of the $30,000 LUXMAX USA Grand Prix and Marshall & Sterling Midwest Finals on Saturday. The show will conclude on Sunday with the popular IHJA "A" Medal Finals.